The next story arc of the great sci-fi police procedural, Copperhead #6, by Jay Faerber, Scott Godlewski, and Ron Riley starts off with an exciting chase scene that exemplifies Sheriff Clara Bronson's tenacity and bravery. Thankfully, we also get to see a more human Bronson during her downtime. We've always known her as a hardass and a brilliant detective but as the story digresses the creative team does a great job at developing her character. After a rigorous and involved murder mystery that took up the first arc of the series, issue six slowly builds the next arc by maneuvering players in opposition of Bronson just as she tries to find some peace and maybe some companionship while off duty. However, it's Friday, it's payday and in a mining town, folks don't always know how to blow off some steam. Still, it's nice to see Bronson let down her guard for once and engage other characters than just her deputy Boo. The school teacher she speaks with looks like a promising romantic interest. Of course, not everything is kosher. Her son meets with Ishmael secretly now that he's been banned from the Badlands. And what does Mister Hickory want with Boo anyway? As usual the art from Scott Godlewski and Ron Riley is spectacular. From the first page, things get moving with a chase scene that resembles the pod racing sequence from Star Wars: The Phantom Menace. The lines mimic motion and the layouts set-up Bronson's daring capture of the perp by building tension with each panel. Riley's colors always liven up the issues with distinctive colors that are bright and warm and add dimension to every scene. 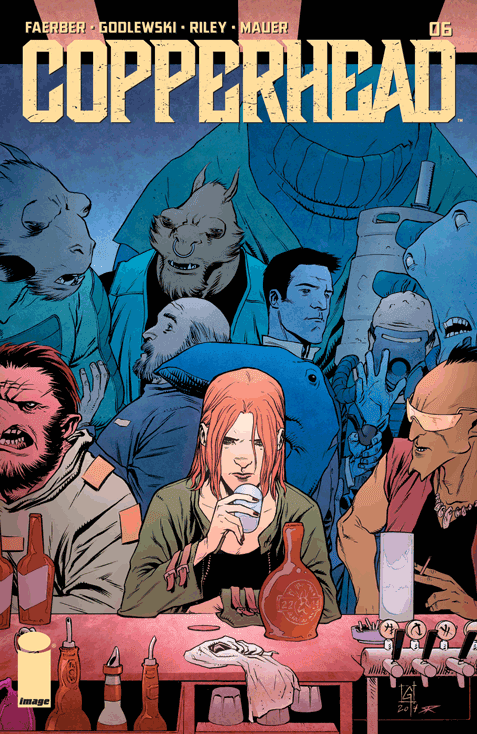 Copperhead continues to be a great read with complex characters, brilliant art and absorbing storytelling. Now would be a good time to jump on this title with this new arc.